Andy Summers has written a number of books and essays over the years revealing the intimate details of his career as an acclaimed guitar player. Andy followed up I’ll Be Watching You with another collection of photographs entitled Desirer Walks the Streets. This collection includes a wider range of photographs taken by Andy between 1983 and 2008. The shots capture his days as a traveling musician in global locations ranging from Bolivia to Tokyo. Photos from this collection and I’ll Be Watching You have been featured in exhibitions around the world. I’ll Be Watching You: Inside The Police 1980-83 is a collection of black-and-white photographs taken by Andy during the early 80s chronicles his experiences with The Police, delving into the personal, unexpected intricacies of the band. The poignant photos capture the band’s experiences making music, enamoring audiences, and securing their place in rock and roll history. In 2006 Andy published his autobiography, One Train Later. 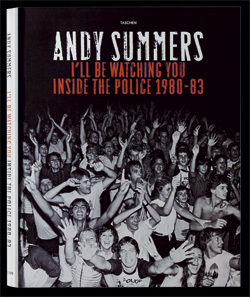 In a review Q magazine wrote that Andy’s autobiography is “A consistently droll read… Summers freely acknowledges the many idiocies and falsities of the rock and roll life but is equally assured of music’s redemptive, unifying force.” The book is a surprisingly honest and self-reflective look at Andy Summers experiences on the road with The Police, the earlier bands that he worked with, and his interactions with such iconic artists as Eric Clapton, Jimi Hendrix, and John Belushi. In his time Andy has gone through a number of mind-blowing experiences, and he didn’t hold back when chronicling his life in this acclaimed autobiography. One Train Later has become the basis for a documentary Can’t Stand Losing You about Andy and The Police which is set to be released in the summer of 2012. In 2004 Andy contributed a series of essays to a book entitled Light Strings. In Light Strings: Impressions of the Guitar, Andy united with infamous photographer Ralph Gibson. Their work together resulted in exhibits at the Hermes galleries of New York, Los Angeles, and Paris. Andy’s first published book, Throb, is a collection of black-and-white photography that Andy took while on the road with The Police that was published in 1983. This rare treasure trove of early photos is currently out-of-print, so if you happen to come across a copy, be sure to pick it up. Reviews of each of Andy’s written works are featured on the website. His books, One Train Later and Light Strings, have received acclaim from such sources as Publishers Weekly, Kirkus, Daily Vault, and JazzTimes. Over the years Andy has given countless interviews with the biggest publications in the business. Three of those interviews are featured on the website including a talk with Turibio Santos and another with Acoustic Guitar Magazine.